The heart of the city revealed! 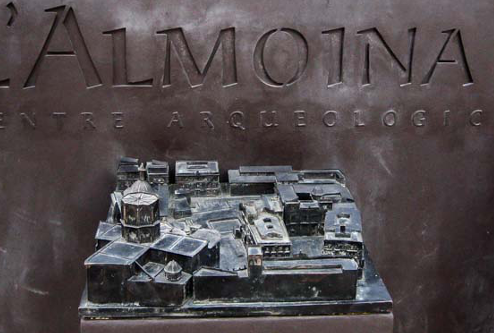 The Almoina Archaeological Museum is the premiere site of ancient historical interest in the city of Valencia. Discovered in the 1970’s, archaeologists revealed the very center of the original Roman city, unearthing the baths, granary, forum, administration buildings, Roman roads as well as the foundations of the Visigoth cathedral and an impressive courtyard of a Moorish Governor‘s residence. In this place the visitor can witness three different time-periods of the city of Valencia all within one facility. Traversed by elevated catwalks, the Almoina brings the visitor inside structures which exemplify the Roman, Visigoth and Arabic influence upon Valencian history for the last 2000 years. There are also galleries in the Almoina dedicated to artifacts from Valencia‘s past: ceramics, glass, metal objects and stone carvings which all detail aspects of life as it once was. 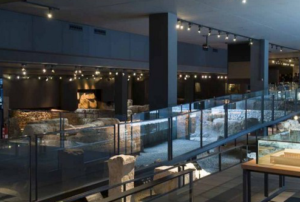 The whole excavation has been delightfully covered with a unique glass roof immersed in water, which allows light to fall on the site with a dream-like quality which heightens the excitement for the visitor. 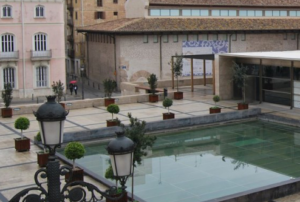 No visit to Valencia would be complete without a visit to the The Almoina Archaeological Museum.